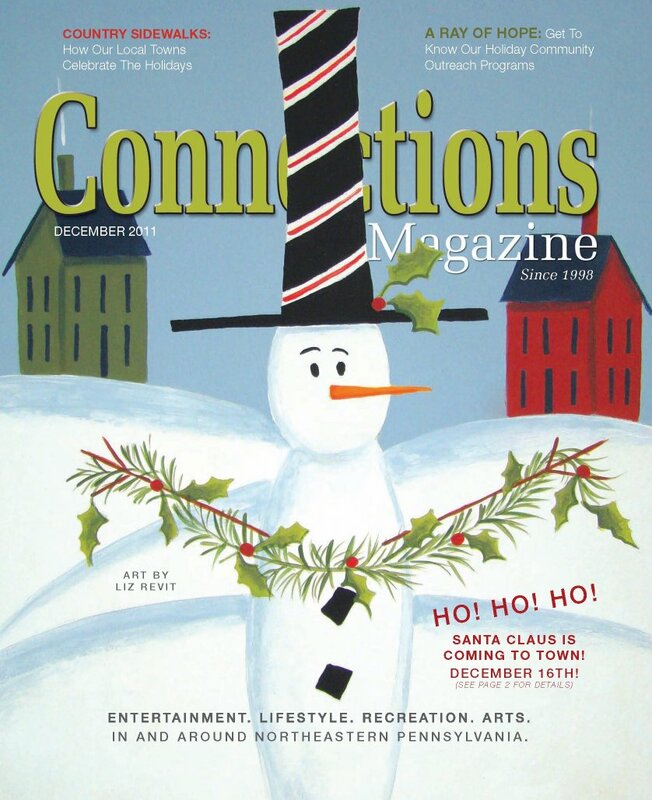 Once again, I'm honored to have landed the cover of the December 2011 issue of Connections Magazine. When the folks at Connections contacted me about reviewing my artwork for this cover, I was elated since this is my fourth cover for Connections Magazine. I can't say enough about everyone at Connections Magazine. I truly appreciate their support. To learn more about Connections Magazine, click here. Fellow CHA designer Theresa Cifali was kind enough to feature me on When Creativity Knocks. Here's a glimpse of me working on one of my latest design collections inspired by the beach. 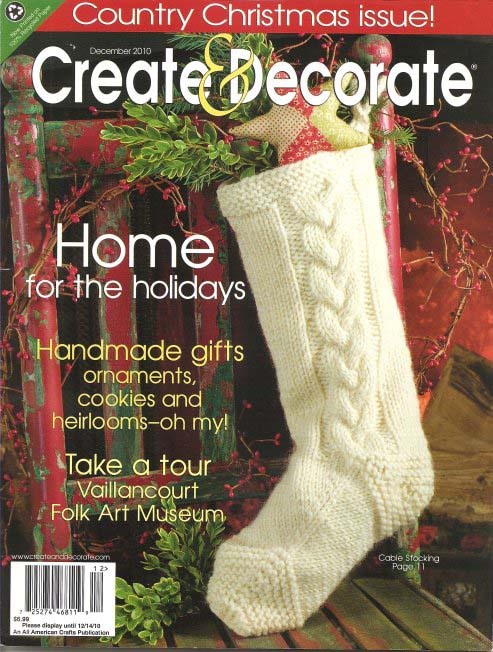 Check out Liz's latest paper mache project in the August 2011 issue of Create & Decorate magazine. 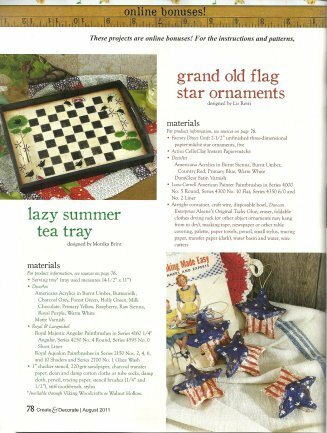 If you love primitive, patriotic crafts, you'll love Liz's grand old flag star ornaments project. 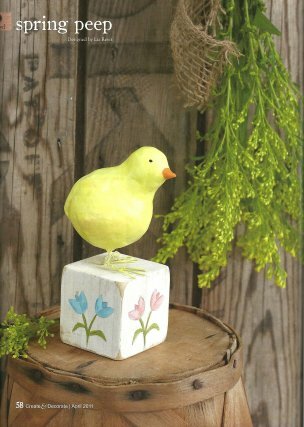 Liz is excited to announce that her spring peep paper mache project is featured in the April 2011 issue of Create & Decorate magazine. Using Dixon Prang DAS Pronto Modeling Clay, Americana acrylic paints by DecoArt, and STYROFOAM™ this project is perfect for beginner and experienced sculptors alike. If you're into sculpting and painting, give this project a try. 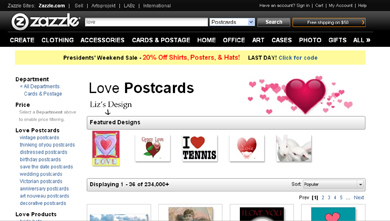 Liz Revit's Love Heart Design is Tops on Zazzle! Here's to another winning design by artist Liz Revit! 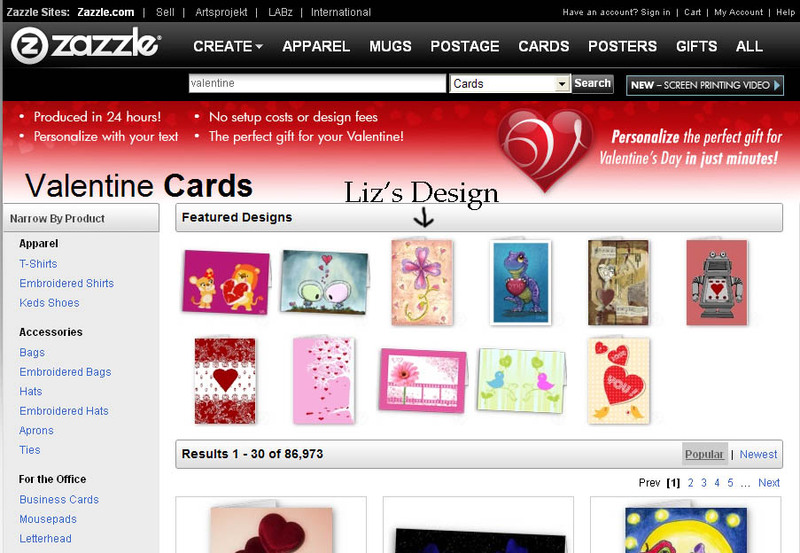 In February 2011, Liz Revit's Love Heart card was chosen as one of the top Love cards on Zazzle.com. 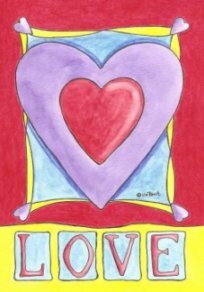 According to Zazzle.com, "Your Love Heart card has been hand-picked as an example of creativity at its finest. Out of the billions of designs on Zazzle, yours was chosen for being one of the best." As a reward, Liz's design will appear at the top of the page listed below in the "Featured Designs" section for approximately 2 weeks. 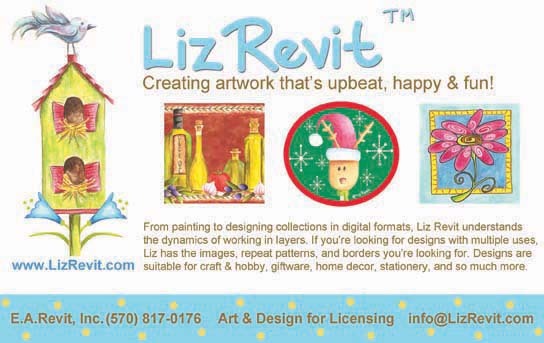 Be sure to check out Liz's latest ad on page 46 in the Winter 2011 issue of Total Art Licensing. Read the digital issue by clicking here. December 2010 - Liz Revit is happy to announce that she's been accepted as a designer member with the Craft & Hobby Association. 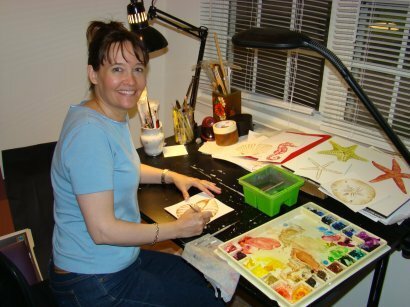 As a writer and designer for crafting and jewelry projects, and as a licensed artist whose artwork can be found on a variety of consumer products, Liz is thrilled to be associated with Craft & Hobby Association. Liz Revit is also a workshop instructor who loves to share her design knowledge and expertise with students. 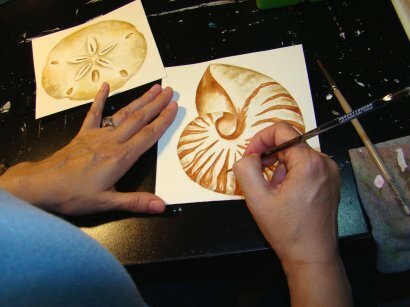 She teaches at national jewelry shows, craft stores, art centers, and at her studio. She welcomes inquiries from product manufacturers and publishers who are interested in partnering with her on a variety of design projects and writing assignments. Here's to another crafty-good project by artist Liz Revit! 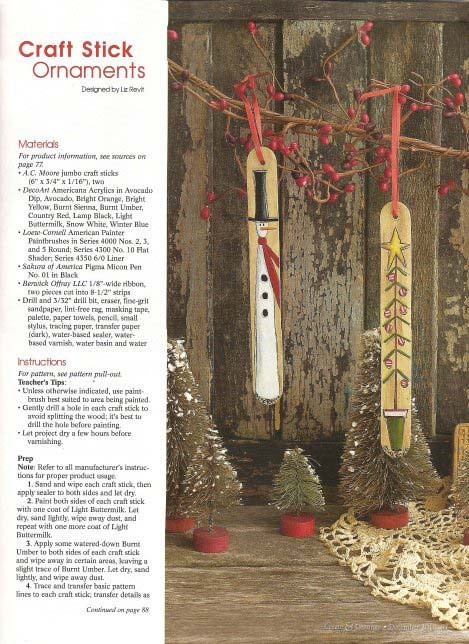 Liz is excited to announce that her craft stick ornaments project is featured in the December 2010 Country Christmas issue of Create & Decorate magazine. Using jumbo craft sticks from A.C. Moore and acrylic paints by DecoArt, this craft project is perfect for young and old alike. These ornaments can also be used as bookmarks and gift tags. Liz Revit's Valentine Flower Design is Tops on Zazzle! In July 2010, Liz Revit's Valentine Flower card was chosen as one of the top Valentine cards out of 86,973 Valentine Cards on Zazzle.com. Her design was featured at the top of the page in the "Featured Designs" section for two weeks. According to Zazzle.com, "Your Valentine Flower card has been hand-picked as an example of creativity at its finest. Out of the billions of designs on Zazzle, yours was chosen for being one of the best."